This book is proof positive that a free press is paramount to our society. Wall Street Journal investigative reporter, John Carreyou, with the help of some very brave mid-level ex-employees, took down a company valued at $10 billion in a multi-article investigative expose. And, this company, Theranos, and its leaders, Elizabeth Holmes and Sunny Balwani, deserve way worse than what they’ve gotten so far. Carreyou reports on Holmes’ career starting off as an inventive kid growing into a nineteen-year-old Stanford dropout with big ideas and then into a multibillion dollar venture capitalist wizard. Holmes’ goal? To revolutionize some aspect of the medical field. Her idea? Blood collection technology that would do hundreds of tests on a mere pinprick of blood. The problem was the technology didn’t (and still doesn’t) exist. And what limited technology she did cobble together didn’t work. When I saw Rush in the window of Square Books in Oxford, Mississippi, I was anxious to read it. The cover art popped (yes, it’s important) and I was curious to see how the experience of sorority rush is portrayed in current times. Surprisingly, or maybe not, it does not seem to have changed much in the thirty years since I went through it. While this book is in large part about rush, it delves into weightier topics such as generational racism and the inequities in pay and benefits to people of color. Set in Oxford at Ole Miss, the story is told through the eyes of three main characters: Miss Pearl, the beloved African American house keeper in the fictional Alpha Delta Omega sorority; Cali, an un-“pedigreed” freshman from a small blue color Mississippi town; and, Wilda, Alpha Delt/Ole Miss alum and mom to another incoming freshman, Ellie. No good tale can be told without a villain and Patton’s Lilith Whitmore, in her powder blue rompers and matching David Yurman jewelry, rivals Streep’s Miranda Priestly in The Devil Wears Prada. Not far behind her in wicked intent is her aptly Southern named daughter, Annie Laurie, who rises at 6am to do her hair and makeup before 9am class. Here are reviews for three books published last year to catch up on before a busy 2019 year of reading. Author Katya Apekina has written an unusual book that spans years and complex characters. It centers on the relationship of two sisters, their mentally ill mother, and distant, self-absorbed father. After Edie finds her mother, Marianne, hanging from a rafter, Marianne is put in a hospital to rehabilitate. Edie and her sister, Mae are sent from their home outside New Orleans to live with their estranged father in New York. With differing feelings on the matter, Mae and Edie are quite close, yet the presence of Daniel, their father, opens the door to a history they were not prepared to face. Edie, reluctant and loyal to Marianne wants to return home to resume their old life. Mae, alarmingly similar to Marianne, wants to remain in New York and connect with Daniel. And things get a bit weird. A confession: I am weirdly obsessed with Scientology. And not for any positive reason but because I continue to be amazed that what is clearly a vicious cult continues to hoard literally billions of dollars of cash, skirt tax regulations, and subject its participants to what would in any other circumstance be considered slave labor all in the name of ‘religion’. I have read volumes and watched hours on the organization and one thing remains ‘clear’: they are a tough group with which to tangle. In the last month, I listened to Jenna Miscaviage Hill’s audiobook Beyond Belief and read Michelle LeClair’s book Perfectly Clear. Although their experiences within the church were vastly different, their criticisms are perfectly aligned with one another as well as with other defectors from the church. Jenna Miscaviage Hill, although not born into Scientology, was a member from a very young age. Her parents joined and became members of the Sea Org early on. Touted as a privilege and honor to be a member of this internal ‘leadership’ group, the work is arduous and the pay is criminal. Members are expected to work 14 hour days and have family time for less than 10 hours a weekend. Parents spend virtually no time with their children. Once Jenna reached elementary school age, she was shipped off to The Ranch where she was required to do exhausting physical labor and her education consisted of primarily church related things. If you’re looking for an uplifting read, pass this one up. If you’re interested in serious anecdotal and statistical research into the opioid epidemic in this country, read it. Macy focuses mainly on the epidemic in and around her home town of Roanoke and in some of the poorer white areas of the Appalachia’s, but the book is global in its application. Macy interviewed and garnered the confidence of numerous users, users’ families and even a drug dealer, serving a 23-year prison sentence for heroin distribution. Interestingly, that dealer never did ‘herr-on’ as he refers to heroin. He was wise enough to know that his using would only result in his own addiction which would eat into his profits. While he might be a large fish in the dealing pond, he is hardly responsible for the epidemic. Many of the white addicts he sold to turned into dealers themselves just so they could fund their own habits. And small time players can make addicts just as quickly as big ones. Invoking so much of factual 1979 New York, I had to look twice to ensure I was reading a work of fiction. Indeed, author Tom Barbash used real events of that year as a backdrop for his novel, The Dakota Winters. We meet the Winters family through the voice of 23-year old Anton whom returns early from a Peace Corps assignment in Africa, having contracted malaria. Anton arrives in time to help his father Buddy Winters, America’s premier and loved talk show host, recover his career from walking off the set during a monologue and disappearing for months. After much self-reflection, Buddy makes ready for his comeback and needs his son’s support to do so. With maturity and poise beyond his years, Anton traverses his father’s fragile emotions, regaining the trust of those in the business whom felt betrayed by Buddy’s walk off, his mother and siblings trepidation about his father’s readiness for return to t.v., and his own growth as an adult and professional. All of this takes place with his home as the anchor - The Dakota - a real building in Manhattan’s Upper West Side and home to New York’s wealthy, including the Winters, restaurant magnates, authors, artists, and of course, John Lennon and Yoko Ono. Having no expectation when I picked this book up based on a friend’s recommendation, I was surprised by this jarring true story and the austerity with which it was told. Author Tara Westover has written a memoir about her upbringing in Idaho, living under the iron fists of her father and brother, both abusive in different ways, yet all in the name of religion and family good. Westover begins her childhood largely in isolation from mainstream society helping with her father’s scrap business and watching her older siblings leave one by one. Her father, self-righteous, delusional, and paranoid, managed the family by fear. Her mother followed him regardless of his destructive path. The family did not believe in organized education nor modern medicine, and had a great distrust for the government. Tara and her siblings were “home schooled”. Except really, they were not academically educated at all unless they sought to teach themselves. Injuries, of which there were many, were treated by their mother with essential oils and energy healing. Westover had the intelligence and fortitude to understand, even as a child, that hers was not a healthy environment. She’s built up defenses to survive, yet it was not enough, and she had the fortitude to pursue a formal education. In doing so, this small act of defiance created a riff with some in her family, yet it helped to grow her awareness of the world and her own place in it. And over time, she confronted her family’s abuse. 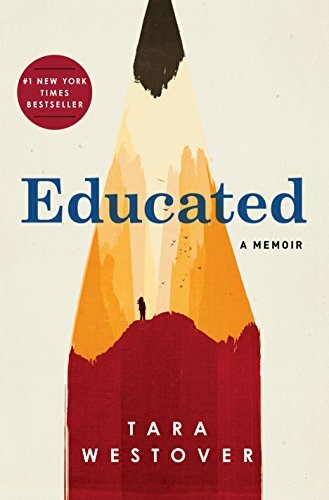 Educated is about a family in crisis that calls to mind Marry Karr’s Liar’s Club. These people are severely broken, yet the author finds her inner strength to break away and discover her own path, fraught with its own challenges. 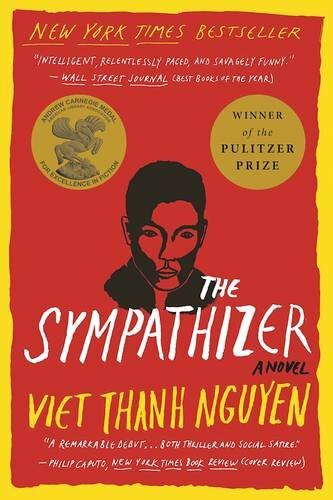 Westover’s narrative style is without melodrama - she soberly conveys her experiences and emotional struggles, sometimes including the perspectives of siblings. She is quite remarkable for not only surviving, but earning her doctorate at Oxford and creating a career and life for herself; although, I’m sure still deals with the aftermath of her family’s decisions and hers. Finding it marketed as Young Adult, I picked this book up with little expectation. Boy, was I in for a surprise. It grabbed me from the start and never let go until the very end which I read with tears dripping onto the pages. In the opening scene, Annabelle, the main character, has a mild encounter with some overly flirtatious boys that sets her off on a ten-mile sprint - in her school clothes and flats while still holding her fast food drink cup. At this point, we understand that there is clearly something going on with her. After spending the night in a hotel just a couple of miles from home, she decides she’s going to run across the country. On her own. She doesn’t know how or really why, but she can’t stay in her current circumstance. Her loud Italian mom, Gina, is having none of it, but younger brother Malcolm, her biggest cheerleader, understands and helps her get going. And, on her second day of running, her true guardian angel, Grandpa Ed, shows up in his RV to follow her during the day and house her during the night. Annabelle’s tragedy comes out piece by piece. We learn she is going to have to face Sean Greggory but we don’t know who he is. We learn of The Taker, a boy whom she never names, but we know she had a relationship with him that went very wrong. We learn of her old boyfriend, Will, and her best friend, Kat, and how she has mental conversations with them. This is not a young adult book. This is an EVERYONE book. I think it should be required reading for all of those going through life. Caletti captures the frailty of the human existence while simultaneously extolling the absolute strength that can come from the human spirit – even one that seems crushed beyond recovery. 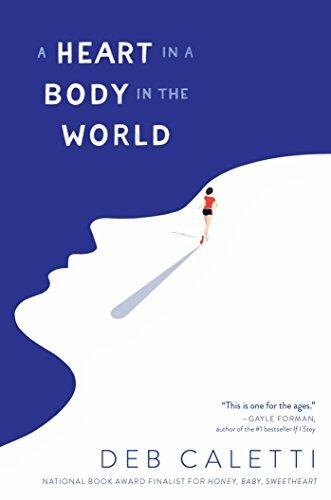 A compelling story with outstanding writing, A Heart in a Body in the World is ALL HEART. This is my first time reading work by Barbara Kingsolver, and I’ve clearly been missing out. Her newest, Unsheltered, is her 15th published book. It is focused on protagonist Willa Knox, her charming and handsome husband, Iano, his ailing father who lives with them, and their two children in various stages of early adulthood and discovery. Willa and Iano are doing all the right things - working hard, saving, kind and loving; yet things are literally falling apart around them - Iano cannot get tenure at the college where he teaches; Willa’s magazine has shut down and she’s now freelancing; her father-in-law’s health is deteriorating, and insurance doesn’t cover enough of the costs; and the house they recently moved into at Sixth and Plum is crumbling around them. Oh, then there are her two children - Tig, the caring, but mostly distant daughter who lives at home; and Zeke, trying to make it in a new career with an infant. Willa has a lot going on, and while she works to hold everything and everyone together, including herself, Kingsolver introduces us to a parallel narrative over a century earlier - of a truth seeking science teacher with troubles of his own. Thatcher Greenwood finds himself newlywed to a privileged wife, along with her sister and social climbing mother, living in a crumbling house…on the corner of Sixth and Plum. Thatcher’s progressive, Darwinism ideas is at odds with the local establishment. He is quite confined by both his family and employer, but holds rather dangerous friendships with both a woman scientist, Mary Treat, and a local newspaper editor who is at odds with the towns’ restrictive leadership. They both encourage Thatcher to work to change the traditional notions of science and learning - a dangerous path, as he discovers. Kingsolver has researched the real Mary Treat for this novel, a nineteenth century biologist, to bring her to life for us as a somewhat eccentric, intelligent, and lovely character. The house is not the only common thread between Willa and Thatcher. Societal and dogmatic parallels can be found in characters across the years. 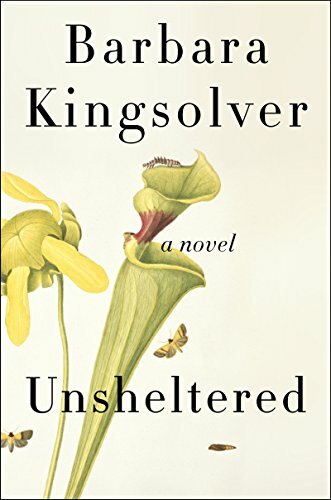 In Unsheltered, while Kingsolver displays a very human side - a happy marriage beset with adversity, children finding their way in adulthood, and well-intentioned people struggling with day to day conflict. She openly shares her social and political stance through her characters, and there is a bit of self-righteousness that comes through. While Willa is a super human to manage the crises that keep coming, it’s the fluid writing and authentic dialogue that really make this book special.